This summer our lab had the opportunity to work with three fantastic Upward Bound Math and Science students through the SEECoS program (Summer Experience in the Eberly College of Science). Students selected for the program show a lot of potential in their high school science classes, but they come from inner city schools that may not give them the preparation they need for college. This is where SEECoS comes in. Once students have been accepted into the program, they come up to Penn State in the summer for six weeks of research and coursework. These courses are designed to prepare the students for high school classes they will have in the upcoming Fall. In addition, students have the opportunity to do a research project with Penn State faculty and students, for which they are required to write a research paper and, during the final week of the program, present to their classmates. Selena, who is entering her senior year at Reading High School and is interested in criminology and, after working with us this summer, herpetology. Kiara, who is entering her freshman year at Reading High School and is interested in veterinary science. A group photo from the first day of SEECoS. 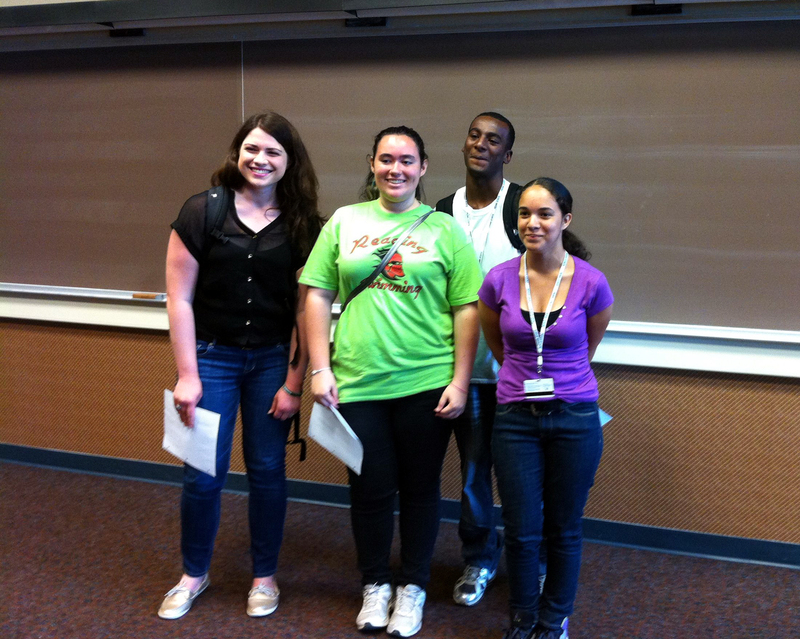 From left to right: Melissa (SEECOS undergraduate mentor), Selena, Jermayne, and Kiara. Our students worked with wood frog (Lithobates sylvaticus) tadpoles lovingly raised by Jenny Tennesson, a graduate student in the Langkilde Lab. Jenny gave the students background information on her system before they designed their research project. She asked students to think about the differences between noisy and quiet environments and how these differences might influence animal behavior. Our students came up with some great ideas, and we decided to study differences in sociality and anti-predator behavior in tadpoles from noisy and quiet environments (ponds with different noise levels). Brad Carlson, another grad student in the lab, helped us develop an exciting project to investigate both sociality and anti-predator behavior over the course of three days. Students set up 12 tubs that they would use for 6 different trials. The tubs contained two mesh dividers (one on each end), and the center of each tub was divided into four equal zones (numbered from 1 to 4). A subject tadpole from a noisy or quiet environment was placed in the center of each of the tubs while a stimulus tadpole from a separate pond was placed behind one of the dividers. The tubs were numbered so that zone 1 was closest to the stimulus tadpole and focal tadpoles in this zone were likely more social, while zone 4 was the farthest away from the stimulus tadpole and should be used by less social focal tadpoles. Tadpole tub complete with subject and stimulus tadpoles. The tadpoles were given 30 minutes to acclimate to the tubs, after which the students added control or predator water to the center of the tubs. The control water consisted of tap water that had been treated with ReptiSafe to neutralize any chemicals that could harm the tadpoles. 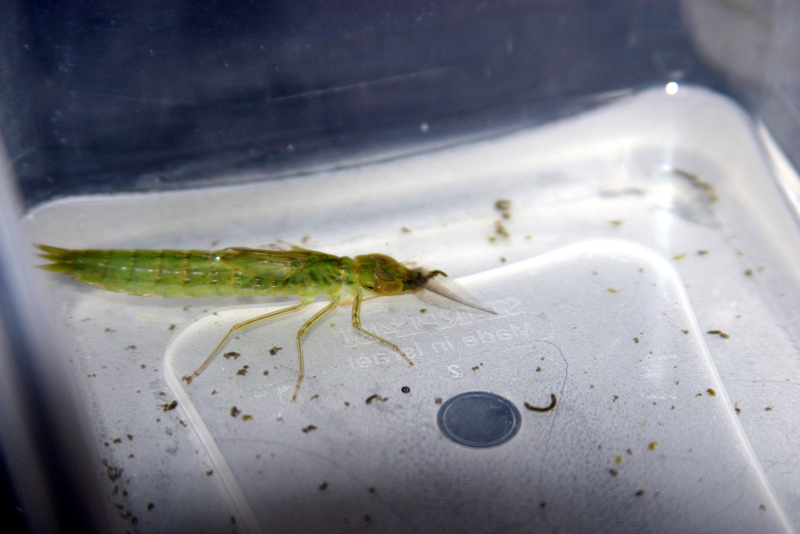 Predator water was obtained from water in which dragonfly nymphs had eaten tadpoles. These cues should make the subject tadpoles think there was a predator nearby. Our students were initially freaked out by the dragonfly nymphs (they do look like aliens with large protruding jaws), but we were able to convince Jermayne to pick one up! 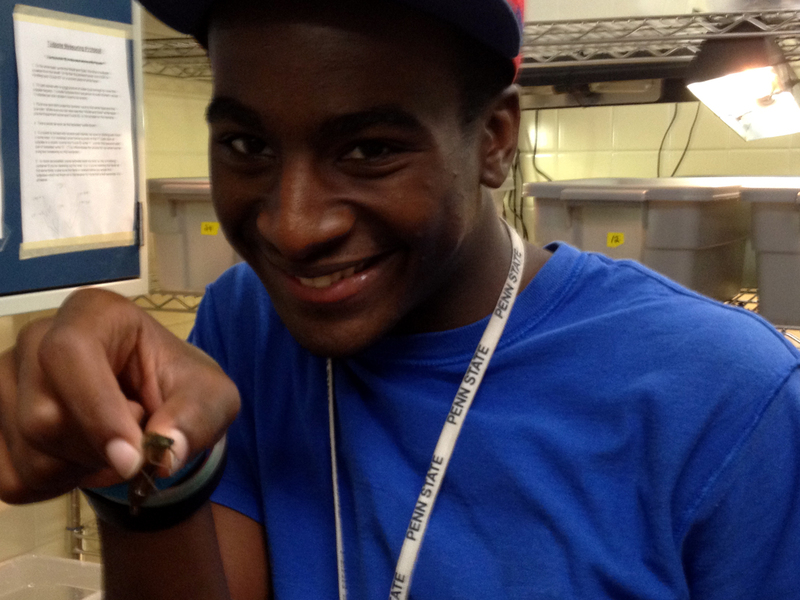 Jermayne holding a dragonfly nymph. A dragonfly nymph munching on a tadpole (photo taken by Tracy). 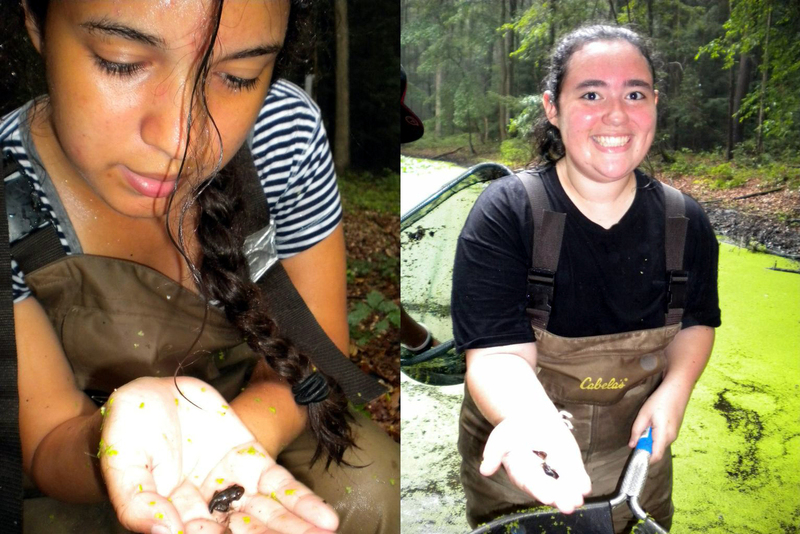 After the tadpoles had adjusted to the predator cues, our students began collecting data. They took turns observing each tub every 30 seconds to record the location (zone #) and movement (moving/still) of the subject tadpoles for 15 minutes. The zone number gave us information about sociality, and taking notes on tadpole movement would help us study anti-predator behavior. After conducting their experiment, our students analyzed their data to see whether sociality and anti-predator behavior differed between tadpoles from noisy and quiet environments. Our students found that, regardless of the type of pond a tadpole came from, the tadpole tended to reduce its movement in the presence of a predator cue. Students also found that tadpoles didn’t show social behavior, although it might be possible that tadpoles from quiet ponds become less social in the presence of predators. Our students also discovered that treatment order matters. They used 36 different subject tadpoles over the course of three days, and each tadpole was used twice. The results showed that tadpoles that were exposed to predators first would stay still even when they were placed in a control tub a few days later. This may mean that tadpoles have better memories than we think they do, if they still associated the tubs with predators. While our students didn’t see any significant differences between frogs from noisy and quiet environments in their results, they gained something much more important from this research experience. They had the opportunity to see how much fun science can be, and they learned that being a scientist doesn’t mean you have to sit in a lab all day. They had the opportunity to handle frogs, lizards, and even dragonfly nymphs! 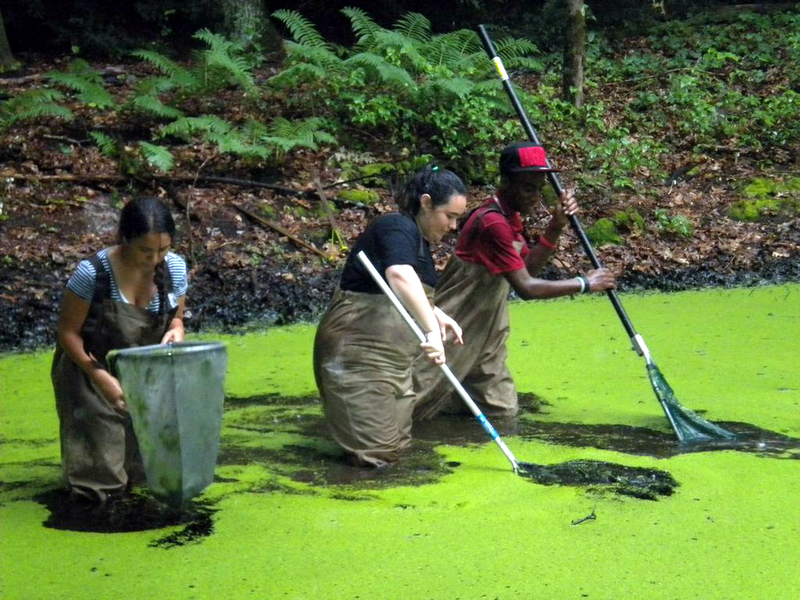 Our students also had the opportunity to go into the field and catch tadpoles and salamanders with Jenny, Lindsey, and Courtney. While they weren’t so fond of the waders right away, it wasn’t long before our students were competing with each other to see who could catch the most tadpoles with one scoop of the net. Kiara, Selena, and Jermayne catching tadpoles. It was easy to see that Kiara, Selena, and Jermayne became much more confident in themselves over the course of the SEECoS program. We’re sure that they developed a love of slimy critters (you know you did!). They were able to design and carry out an experiment, analyze the data, and present their results to their peers. Their enthusiasm for and knowledge of their project earned them 4th place among SEECoS presentations and 6th place for overall best research project. Most importantly, our students learned that they are very capable scientists who can be anything they want to be. We feel so privileged to have had the opportunity to work with such great students, and we know that they will be successful no matter what field they choose! Thank you to everyone who made this experience possible, and we can’t wait for next year! Group photo on the last day of SEECoS. 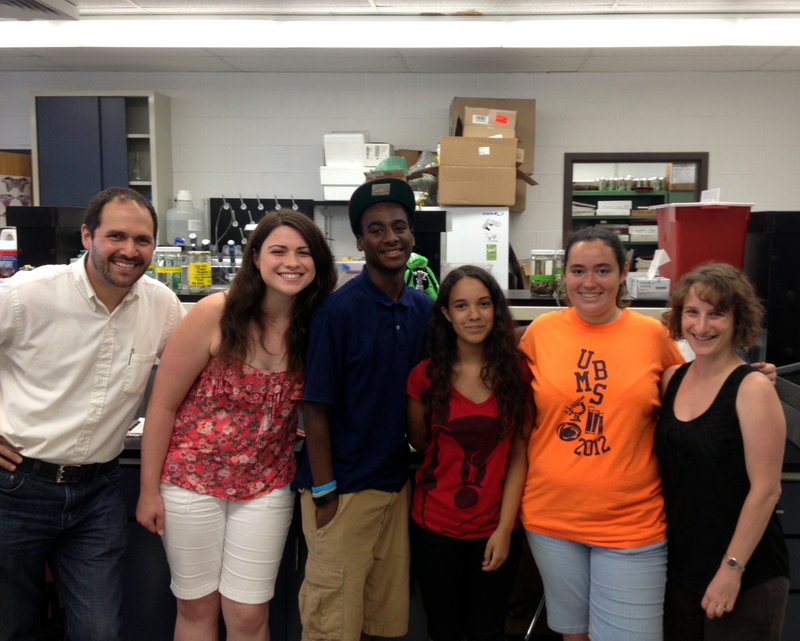 From left to right: Mr. Licona (biology teacher), Melissa, Jermayne, Kiara, Selena, and Tracy. Categories: Research in PA | Tags: noise, SEECoS, Upward Bound, wood frogs | Permalink.